Into the home straight now. Isn't May a quick month?! I started the day thinking I'd probably get rid of this. It's too tight at the arms and I don't often wear it, but by the end of the day I'd kind of fallen back in love (blood circulation issues notwithstanding). I do feel like I've moved away from florals, particularly smaller prints recently, but instead of feeling off, this felt like a refreshing change. A blouse shaped palette cleanser, if you like. I doubt it''ll get worn weekly but it's nice for those days when you are just fed up of everything else in your wardrobe! Keeper. I don't like this anymore. Funnily enough there were a few people wearing Violets today on IG and they all looked great, but I have gone off mine.The fit is off and I just feel like the collar looks ridiculous on me. I still love the fabric and buttons (which match perfectly) so I'm wondering if there is anything I can do to refashion it. 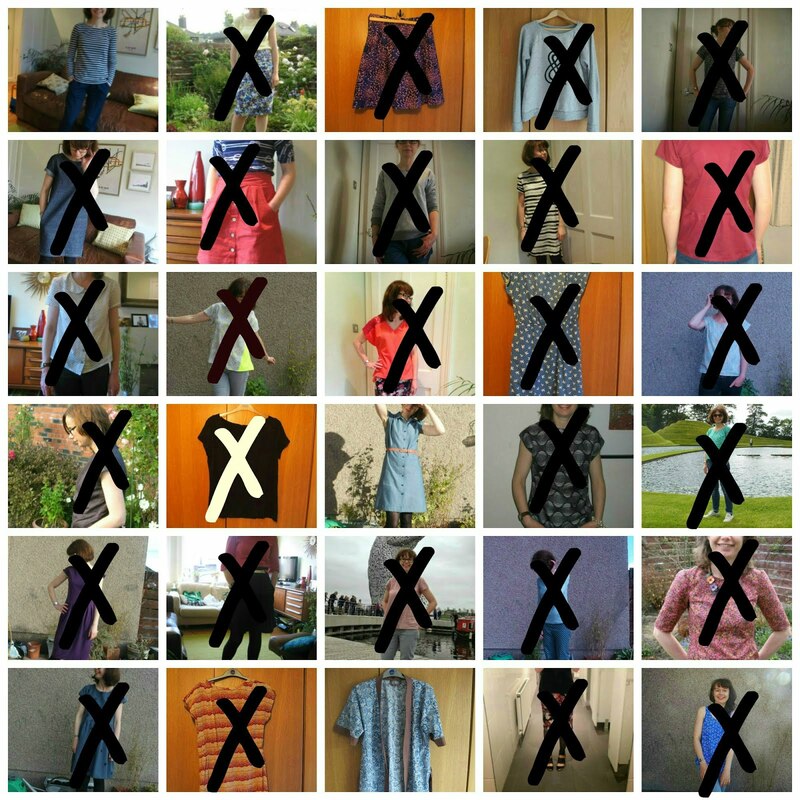 Dispose/refashion. Also, if anyone wants the pattern, cut in a size 4 (it was in the days before I knew about tracing), please let me know. I will happily donate it to a good home. I don't see me making this again. 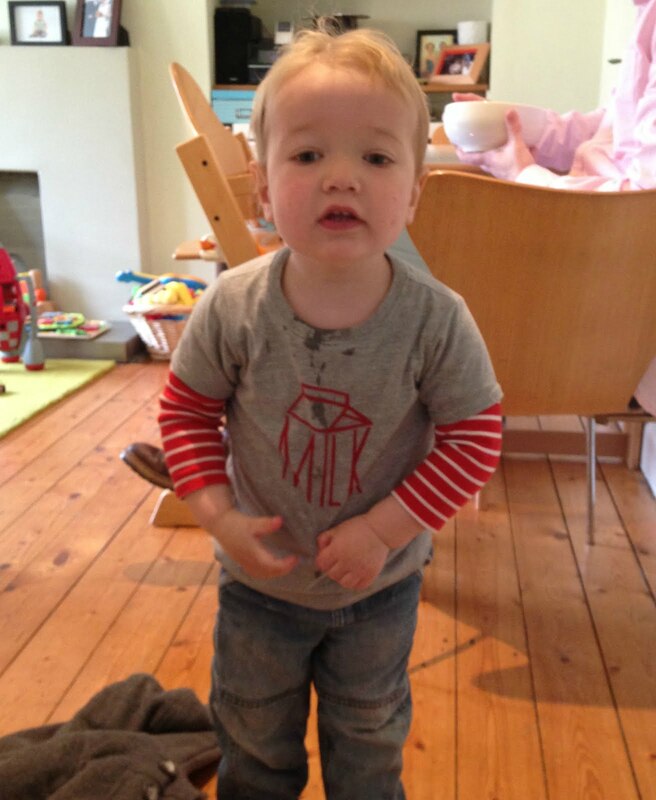 Bonus pic - Baby boy, deeply engrossed in Tom and Jerry, in his elephant tee (another Rowan Tee). This wasn't in my original round up because I'd forgotten about it. I like this, but I don't often wear it. It's a little wide on the neck, and something about the fit isn't quite right. But I still love the button and pocket detail at the back, so I'll just aim to wear this more often. Keeper. Love. Love. Love. Love. And it looks totally excellent with bare legs and clogs (you'll have to take my word for that). Keeper. Love this top. I wear it a lot. The colour is great, and I love the ruffle detail at the back. I'd like to make a similar one in double gauze. Keeper. This skirt is OK. Just OK. It's a bit meh, but it's comfy and is a decent basic for work. I probably need more solid tops to go with it. Keeper, purely because it's useful. We went to see Brian Wilson tour Pet Sounds album at the Usher Hall. AMAZING!!!! God Only Knows was our first dance at our wedding, so it was really lovely to see it being performed live. I always get loads of compliments on this, but I never truly love it. I like all the elements - the lace, the colour (I LOVE the colour), the shape - but somehow I don't love the sum of the parts. I'm keeping it though because of the colour and it does get a fair bit of wear. It's a useful bridge between too dressy and too casual, too! Keeper. See previous comment in week 1 for my thoughts. I also tried on my Ultimate Trousers this morning. No pictorial evidence, but they are too big and thus unwearable. I am keeping them as a muslin, for future makes and then will donate them to charity. Dispose. I'm still going strong with Me Made May. 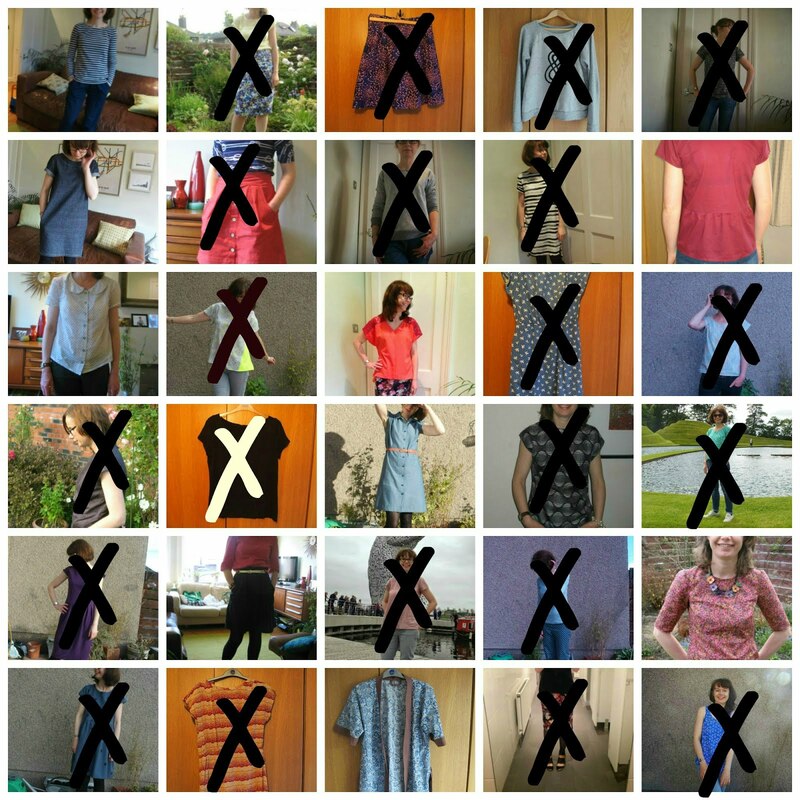 I haven't found it too difficult, although there are a few RTW items that I'm starting to miss. I only have a few items left to wear, too. What about you? Fed up yet? Or still powering on through? How is it possible that it's Friday again already? Such a busy week! My first repeat of the month! You already know that I love this tank, so no further comments necessary. Love this dress. It’s been worn pretty much weekly since I made it. So comfy and it looks great. I got lots of compliments (both on IG and IRL) today. Keeper. Love this dress too, although I’m wondering if it has shrunk in length. It seemed particularly short today. Anyway, this also gets tonnes of wear. Keeper. This is a bit wintery TBH, although it’s very comfy. It’s a bit big on the waist now (another item made during Mat leave), so I ended up fiddling with it a lot during the day. I’m certainly not unpicking a black zigzag stitch, so I’ll have to see if I can take it in some other way. 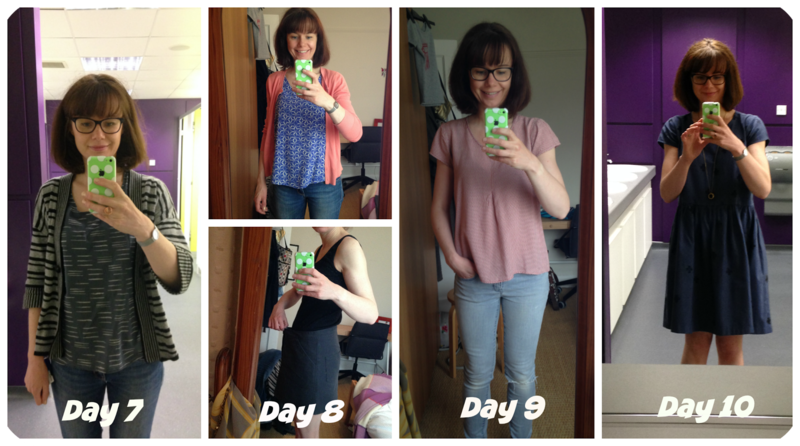 It will also work in summer without tights and with a more summery top (which I will have to make/wear…). Keeper. 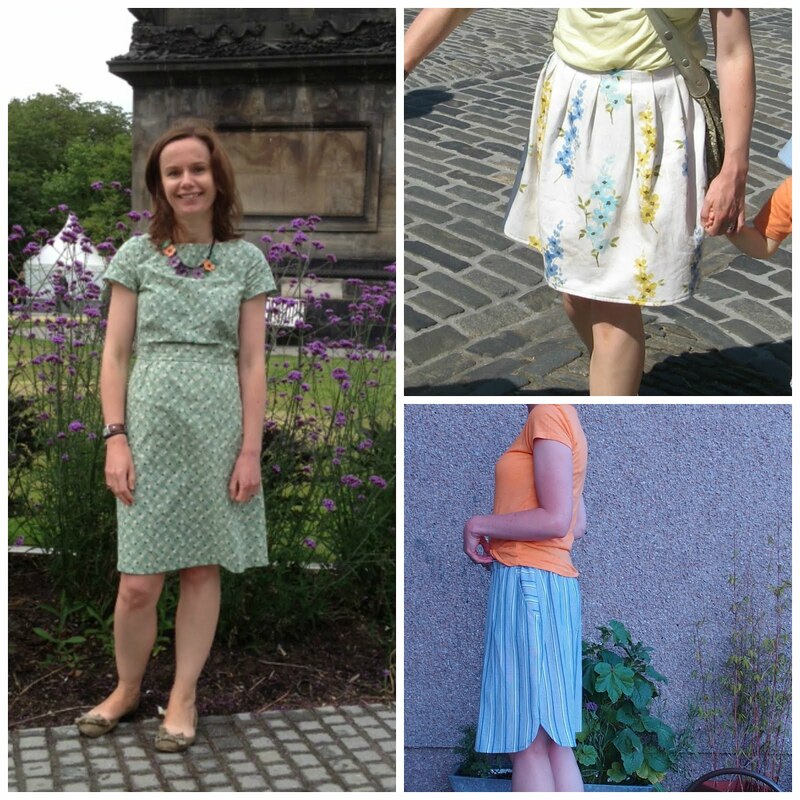 This is the first skirt I made when I went to a sewing nightclass nearly 7(!) years ago. Therefore it was made pre-kids (only just pre-pregnancy), and it still fits! I haven't worn it for ages, probably literally years. It's not really my style any more but actually I really enjoyed wearing it today. 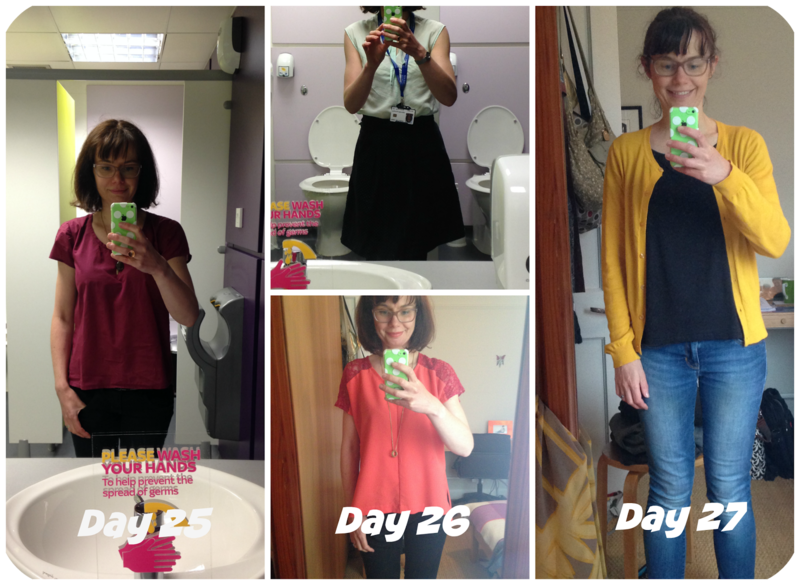 I did feel like I'd dressed my top half for summer and my winter half for winter, though. I think I will keep this a while longer, even if it doesn't get tonnes of wear. Keeper. Note - this Primark tee is nearly my perfect tee shape (pity it's so badly made, in such awful quality fabric). I should probably do some sort of rub-off before it completely disintegrates! This tee annoys me. I have been putting off wearing it, although when I first put it on this morning, I couldn't remember why it annoys me. It seemed OK. The neck is very high, but it's wearable. And then I put my ampersand Linden over the top and I remembered why. You can't wear it with anything else. I don't know if it's the fit or the fabric but it just doesn't sit well under a sweatshirt or jumper. It gets all bulky and the neckline sits weirdly, like there is too much fabric there, or something, Which is why I haven't worn it all winter. I will persevere with it for summer and then decide. I love the colour, but if it's a top I don't feel comfortable with I'll bin it, or cut it up to make something for one off the boys. 9 items and 10 days still to go. Still feeling doable! OK, so let's crack on with this week's round up. This gets worn all the time, since I realised it goes with this cardigan, which is actually Country Casuals and used to be my Mum's! I have made quite a few Scouts but there is something that slightly bugs me about this version, that I can't quite pinpoint. The sleeves kind of stick out, and the shoulders don't quite sit right. That said, I still love this Scout for summer or winter. Keeper. This is a happy top. I mean how can you not be happy wearing such a beautiful, bright, saturated blue?! My only Eucalypt so far, but I love this. A bit more of a summery item, but it will get worn lots this summer, and I really need to make sure I make more! Keeper. Bonus pic for today: my Grainline Moss mini. This was always in the "debatable" category and you can see why here. I honestly was planning to wear this today, but it barely stays up. I have chucked it in the cupboard for the time being. I'm ostensibly keeping it as a muslin for a future make, but honestly, I think I need to size down before I even start doing anything else, so this will probably go to the charity shop instead. Sad face. Not a keeper. Leaver? 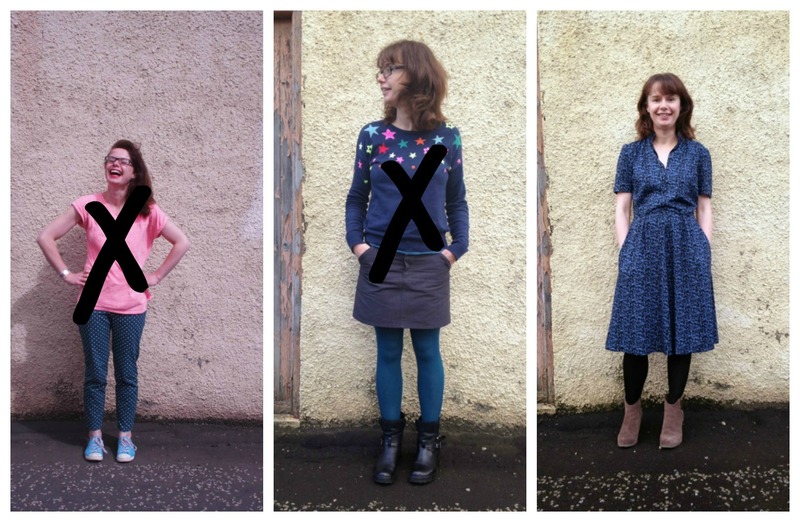 Thank goodness that some of the items I made while on Maternity leave still fit! This was made with easy access for breastfeeding in mind, but it continues to be an item that is worn a lot. Keeper. I honestly didn't mean to wear all the Scouts in one week, but I guess it's a good advert for how versatile this pattern is! Love this dress. It's very swingy, and, as I learnt today, has potential for a Marilyn-style wardrobe malfunction on a windy day. But still! Super comfy, cool (in both senses) and I PRINTED THE FABRIC MYSELF! Keeper! Um, yes. I am wearing a maternity tee here. As it was originally, unadulterated maternity tee. The extra fabric is just all tucked in. I really need to make something else to go with this skirt. And probably alter this tee. The skirt? I only wear this in the summer, but I wear it all summer long, and apparently I haven't gone off it, so it's likely to live another year in my wardrobe. It does need taken in at the waist though. Must do that. Keeper. I actually was planning to get rid of this dress. I have worn it almost to death since I made it pre-blog, summer and winter, and to be honest I am just a bit fed up of looking at it. Plus the fabric has faded a lot, particularly at the hem (no idea why there particularly). But having worn it today, I think I'll keep it for the summer at least. It's a great shape, it's comfy to wear, and it's a great dress for a summer's day. Keeper. For now. Still love this. Love the print. Love the shape. Keeper. Bonus pic - Titchy Threads Rowan Tee and self drafted hat (not yet blogged). Small Boy had Book Week at school this week. No idea if this was a national thing, or if it was just his school. Anyway, today he was to dress up as a character from a favourite book. 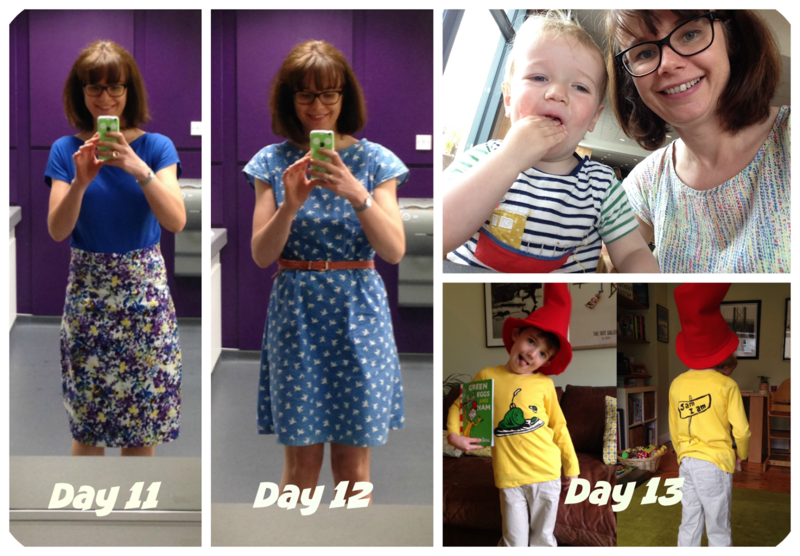 We picked Sam-I-Am as a relatively easy costume to make, although it did take me all week! Totally worth it though. I had to prise the hat off his head at bedtime. 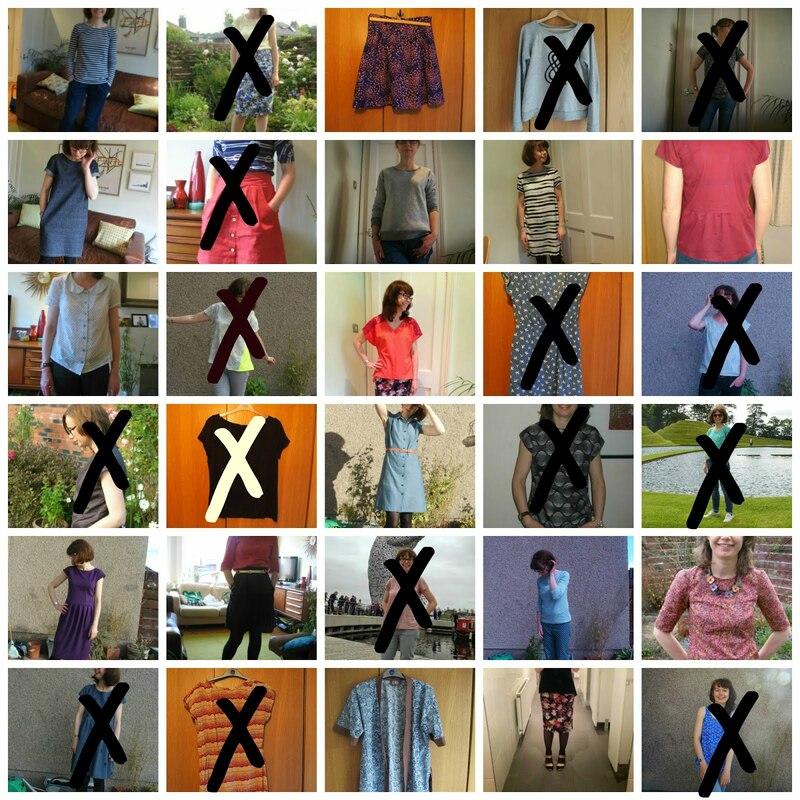 A further 8 items worn, with a further 14 still to wear. I have also tried on and discarded one item from my "debatable" category, with only 2 still to try. 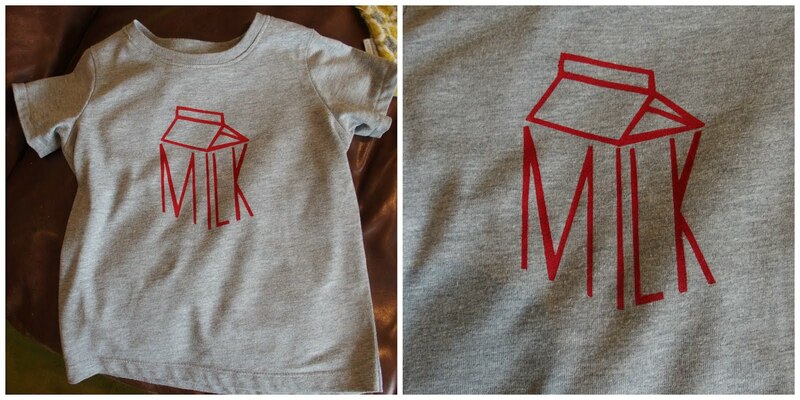 Plus the maternity tee which I wasn't included in the initial count purely because I forgot about it! Not bad going. Also, I'm surprised to see such a lot of blue. I genuinely wouldn't have thought it was a colour I particularly gravitated towards, but apparently I do. Just shy of the halfway point. Are you fed up yet, or are you still going strong? What's the curse of the sewist? Too many plans, not enough time? Killer stash avalanches? Pins in the sofa? Or is it that little thought that needles its way into your head at 7.30 in the evening, which says "of course you have enough time to make and stencil a t-shirt for Baby Boy's birthday tomorrow..."? So, guess what I did on Thursday night? I literally have no idea where the birthday t-shirt desire came from. I previously felt no need to make him anything, although I have had this particular t-shirt planned in my head forever. But anyway, after we put the boys down that night, I dug out the stuff and got cracking! The pattern is the Titchy Threads Rowan Tee. Such a great pattern, with so many variations, and I always go for basic view A every time (here and here). Anyway, I already had age 2 cut out with the exception of the short sleeve piece - so, no need for faffing around sticking PDFs together - and there are only 4 pattern pieces, so I was on to a good start. The fabric is repurposed from a maternity t-shirt, I've had in my upcycling stash for a while. In my memory, the fabric was actually a bit nicer. In reality it's about 70% polyester, 30% cotton, which wouldn't be a my first choice for the boys, but the weight was good, and the plain grey marl was a good canvas and is boy friendly. I managed to squeeze all the pattern pieces in and even was able to reuse the ribbing at the neckline. Win! I reused the bottom hem to save on time too. 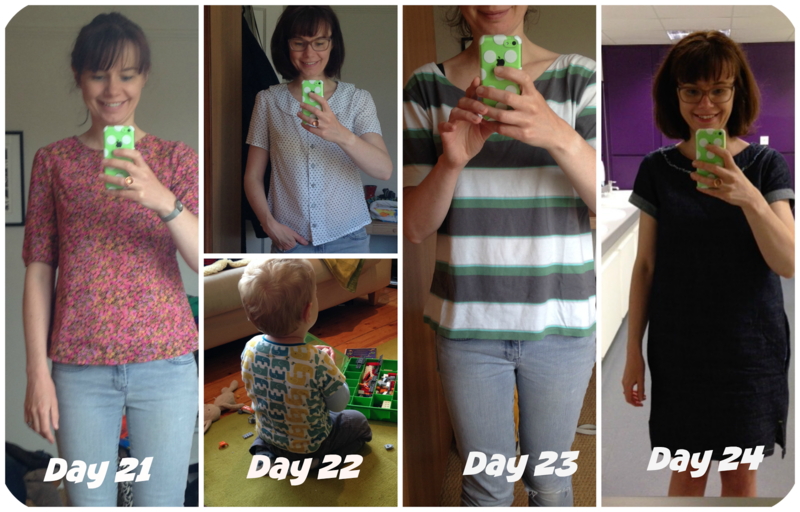 As this was a maternity tee, it had a dipped hem at the front, but it wasn't too pronounced, so I used that for the back pattern piece, thinking a slightly dipped hem at the back would make more sense on a kids tee, and used the back for the front. The original sleeves were cuffed, not hemmed, so I couldn't do the same there. No biggie, though. Pre-smudging. Look how neat it was! I've made this pattern 4 times now, so it was dead easy and went together without any problems. I sewed it with the lightening bolt stitch and left the edges raw. The sleeves and top stitching at the neck are done with a triple stitch, which is sturdier than my twin needle, particularly for boys clothes. The original hem was sewn with a coverstitch so it doesn't match, but really, who's going to notice that? I do kind of wish I'd done the topstitching in red to match the print, but that would have meant taking a lot longer over the topstitching, as it would have been visible. Plus I never thought about it until I'd done the sleeves and unpicking triple stitching simply wasn't going to happen. I came across the stencil on Tara's blog a while back, and have coveted it ever since. I think it's so cool. She has a few that I love - I've definitely earmarked the stormtrooper one for Small Boy. It took a bit of time to trace and then cut out - those narrow lines are pretty fiddly. As with last time, I used freezer paper, and the speedball block printing ink, this time in red. It all worked really well, and I was very pleased with it. I finished at about 11pm and left it to dry overnight, and as the ink felt dry in the morning, I put him in it. However, about half an hour later, P noticed that the ink was running a bit, and sure enough it had smudged, over the t-shirt and over one of the (white, obvs) pillowcases on our bed!!! Now, this is totally my fault. As I've mentioned before, the ink needs to cure for 5-7 days before it can be washed. I naively assumed that once it was dry, it was completely dry and that he could wear it as long as I didn't wash it. NOT THE CASE! With smudging. Sorry, design feature. I took it off him immediately (and got the pillowcase straight into a basin with some Vanish!). Initially I was really annoyed. The freezer paper gives such a clean edge, the ink looked perfect and pretty professional. But, there wasn't much I could do about it. I took a photo later and popped it on Instagram and all commenters said either the smudging wasn't obvious, or that it added to the look. So, now it's a design feature! But not one that I will be repeating. Lessons learnt? Follow the instructions. And be more organised. And call mistakes design features, and then move on. Baby Boy loves it. "Monks" (his word for milk - all liquids are plurals right now) is his favourite drink,which he demands as soon as he wakes and as soon as he gets out the bath at night. I remember Small Boy weaning himself off his cup of milk in the morning and afternoon, but Baby Boy is reluctant to give it up just yet. So, no doubt, he'll be looking forward to wearing it next week at some point, once the ink is truly dry and cured. And now, because this post is a bit photo-light, here's a photo of him blowing his birthday candles out. Sweetie that he is! Not quite a full week, but I always do these round ups on a Friday. So, how many items have we scored off so far (also note, I managed to do the graphic I had imagined, thanks to picmonkey). Love this top. It didn’t get much wear over the winter, being fairly lightweight, but for spring and summer it’s perfect. 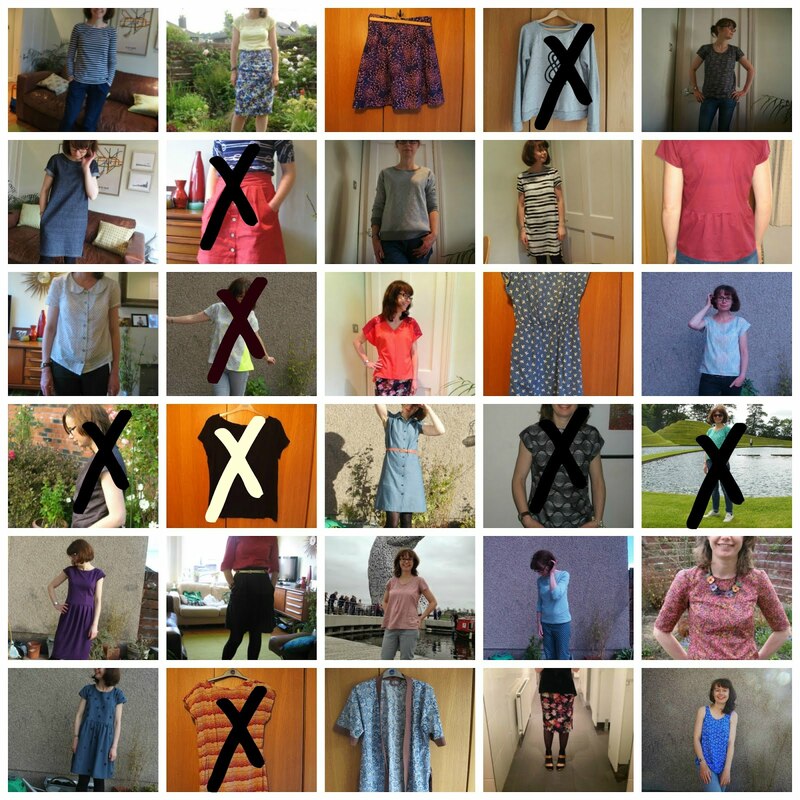 I really need to make more of this pattern if I can find similar weight co-ordinating fabrics, perhaps sleeveless next time, as the sleeves are the only part I’m not sold on (that may well be my sleeve setting issues though!). Keeper. Love love love this skirt. It gets worn summer or winter, rain or shine. It goes with bare legs and sandals, or tights and ankle boots. 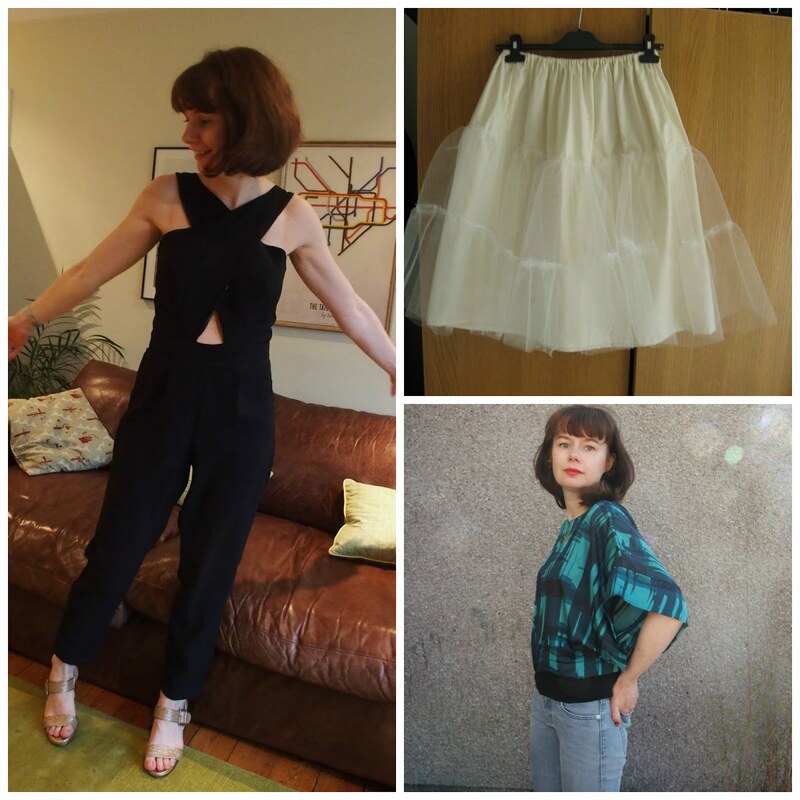 I have struggled in the past with what tops to wear with it – from a shape point of view rather than a colour/print issue. Depending on the top, I don’t always love them tucked in. 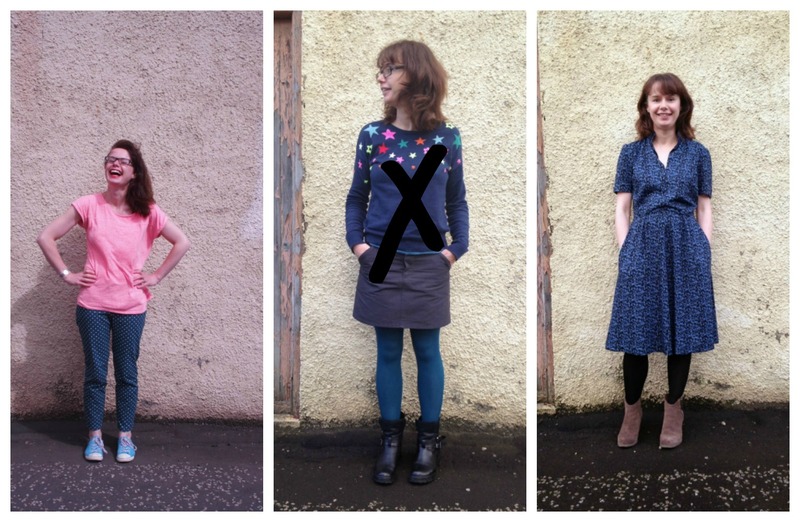 And I really hate tucked in blouses with a cardigan over the top – it all feels so fussy and clumsy. This blouse pairs perfectly though, and I think making an Astoria, or similar cropped sweatshirt would work well for next winter. When I first made this blouse, it didn’t get a lot of wear as it was really too short to wear comfortably with jeans or trousers. Then last summer I thought to pair it with this skirt and a match made in heaven was born! Again, this blouse doesn’t get much wear in the depths of winter, but our office is really warm, so it’s perfect to wear to work right now, and through the summer. Plus it’s Liberty tana lawn, with secret kissing people! Keeper. Today there was a bonus video. Small Boy snuggled up in my Nani Iro quilt. He loves this, and wears it softer side (the colourful side) down for extra snuggliness, while watching TV most days. 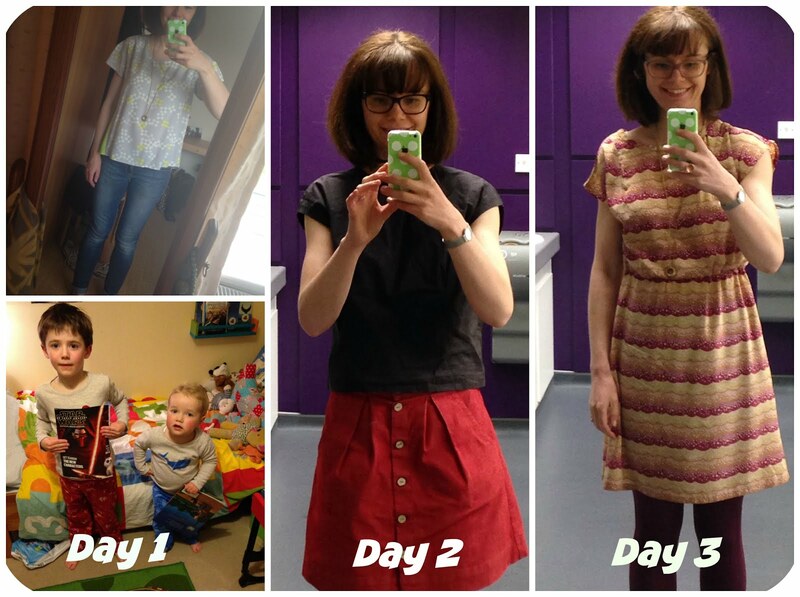 This dress isn’t one I want to wear on a weekly basis, but it has been worn fairly regularly since I made it pre blog (so, over 3 years ago). I prefer it in winter with tights, as I hemmed it a little too short to be comfortable with bare legs. I love the print, despite the colours being not very “me”. My favourite way to wear it is with coloured tights and gold sandals (for drinks/dinner, not for work), as it kind of feels 70’s glam cool like that! But, it gets worn more often like this. Keeper. Day 4 - New Look 6356 in habotai silk. This is the blouse which gave me the idea for this particular challenge. It very rarely gets worn, and I'm not sure why. The fit is a wee bit off, and the pearl button/thread chain that fastens at the back comes loose from time to time, but otherwise it's a good top, particularly for work. This is a keeper and I am resolving to wear it more often. 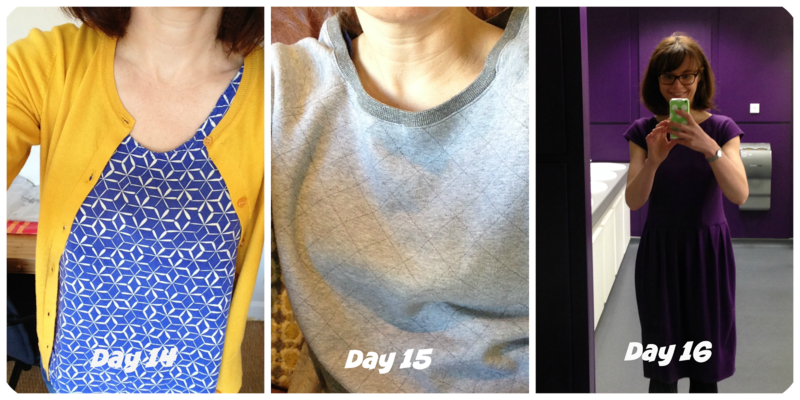 Day 5 - Little Tailoress Emmeline Tee in double gauze. Coming out of winter it's had little wear, but layered over a cami and worn with a cardigan (not pictured obviously), it works. Plus the colour is so cheerful. I would probably wear it more if I had some trousers to wear with it to work. Keeper. Day 6 - Grainline Ampersand Linden, layered over an unblogged black Lark tee. You already know how much i love this particular sweatshirt. Keeper. The tee is a wearable muslin that I made at the end of Jan, I think. I had intended to perfect the fit and make a lot more, but for some reason, haven't. To be my ideal tee it needs a bit of work but it's totally wearable as is, if a bit dull. Keeper, but I need to work on fit and make more. The bonus photo today is of Baby Boy. It is his 2nd birthday and to celebrate, I made him a last minute birthday tee. I will blog this when I get a chance. 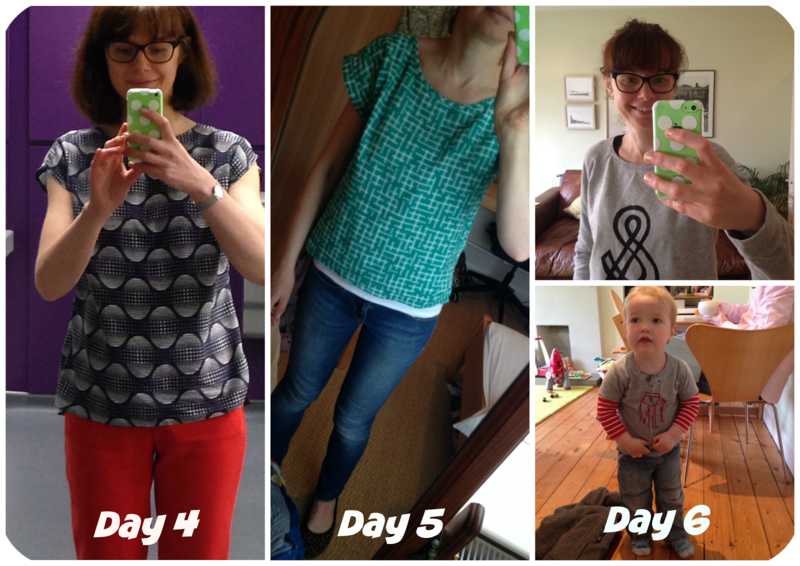 The pattern is the Titchy Threads Rowan tee. A me made wearing a me made! Extra MMM points for that? And that's my first week. No major challenges. I've tried to mix it up a bit so I haven't worn all my faves in the first week. 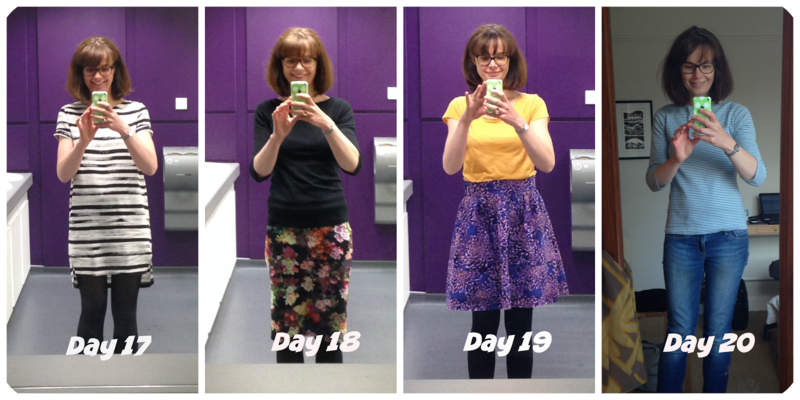 So far I have established what I already knew - I need more solid work trousers and skirts, whether they are bought or made. I should probably work on rectifying that through this month. I probably won't though!! So, here we go. I have split them into 3.5 categories. That will start to make sense as you read. It's true that we can often get 4 seasons in one day in Scotland, but unless the temperatures get above 20°C, I won't be wearing these items. But I'm recording them because you never know! Pretty self-explanatory this one. I will wear all of these at least once during the month. 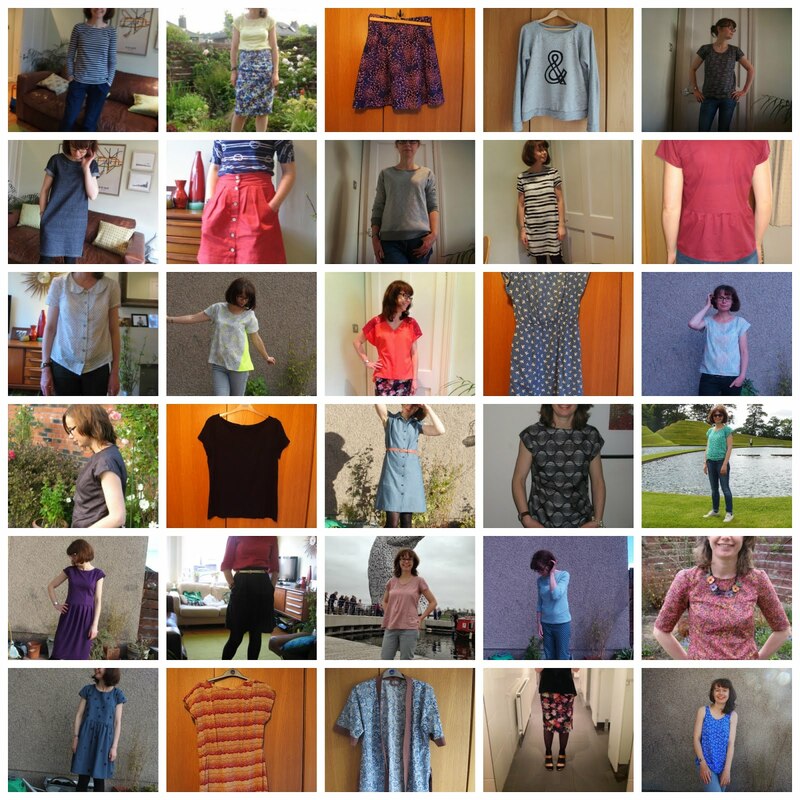 Some have never been blogged, hence the hasty, bad-lighting, hung on the wardrobe photos. Actually most are worn pretty regularly, so it should all be fine. I have a strong suspicion the Moss will no longer fit - like, won't stay up anymore. The 1974 dress is ripped and unwearable (down the front bodice seam). I will attempt to fix it, but I'm not sure it's salvageable. I have an idea that I will somehow score these off as I go. In reality though I'm not sure I have the skills. Let's find out together! Also, you'll have noticed 33 items, but only 31 days. Should make for a couple of interesting outfits!!! I know I said this wasn't going to be a fabric buying ban, and I have spent less than my budget every month so far, but I was still a bit disappointed by the fact that I haven't really managed to stick to my original rules, so I aimed to spend zero this month and I achieved it. It wasn't easy, I will be honest. So many new patterns, so many ideas. But I managed. I used thread and even buttons from my stash. OK, my output wasn't amazing, but still.